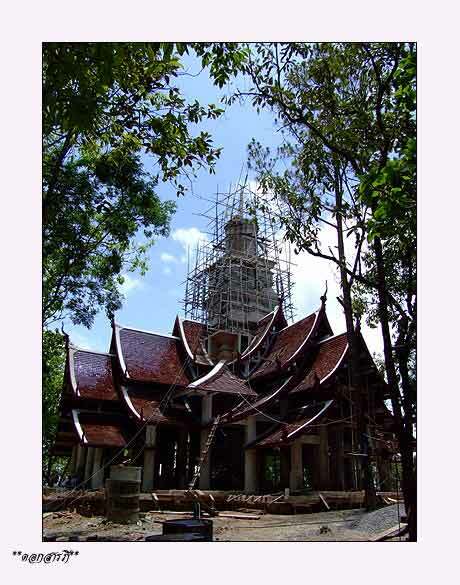 Wat Doi Pha Som has focused on applying King Bhumibol?s economic principle of sufficiency economy in the local villages of the Samoeng District, Chiang Mai Province, Thailand. The King?s guidelines of Sufficiency Economy promote the planting of three types of resourceful plants: plants that are edible (Food), plants that can be used for medicinal, cosmetic, sanitation, and other household purposes (Usage), plants that can be transformed into products for sale (Economic). Plants can belong to one or all of the three plant categories. For example the coconut tree produces food for consumption (coconut milk, coconut shavings), the coconut husk can be turned into charcoal for home usage, and the tree trunk can be turned into lumber for sale. By focusing on these three types of plantations, local communities benefit in four areas: Livelihood, Environment, Economy, Society. Community members (humans, animals, plants) have resources capable of satisfying the basic needs of life (Livelihood). The local ecosystems are revived through the regeneration of diverse plant species and protected through the application of conservational practices (organic farming, formation of tree banks) (Environment). Communities generate natural resources that could be turned into products for sale or exchange in local or regional markets (Economic). Ultimately, communities become self-reliant and in control of their own social-wellbeing (Society). Sufficiency economy is founded first on the principle of local environmental conservation/restoration. In this economic system the generation of material wealth is not the ultimate goal. Instead the final goal becomes creating environmentally healthy, self-sufficient communities in which basic human needs are met through local natural production methods. Economic benefit becomes only a secondary benefit in the larger development scheme. 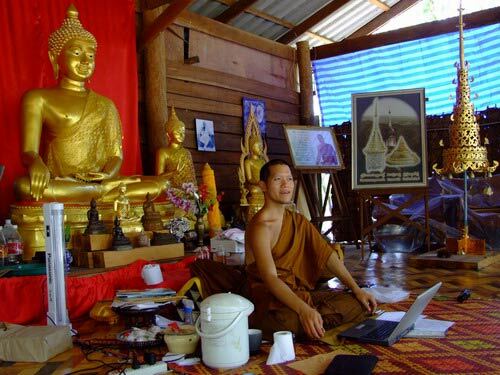 In marketing this economic theory a practical model for sustainable development, the monks at Wat Doi Pha Som define four necessary concentrations of development. The first and central concentration is on Environmental Restoration and Protection. In the Samoeng District, this concentration narrows to focus on preserving the forest ecosystem (Dipterocarp forests). The second concentration of development is Organic Agriculture. The application of chemical pesticides and chemical fertilizers has harmful ecological effects and also creates dependency on distributers outside of the local community. The third concentration of development is the creation and usage of Alternative Energy. The discovery and development of renewable and environmentally-loving alternative forms of energy is essential for creating environmentally healthy, self-sufficient communities free from a destructive dependence on fossil fuels. The forth and final concentration of development is Education. The future vitality of ?sufficiency economy? communities depends on the education of the younger generation. Youth need alternative education models that develop practical vocational skills, promote creativity and equip graduates to be self-sufficient upon completion of their formal education. Five years ago Wat Doi Pha Som initiated an environmental revitalization process in the Samoeng District based on the principles of sufficiency economy. The initial development projects addressed the necessary prerequisite to any reforestation project, sufficient natural water resources. The soil quality in the local area was very dry with little nutrients and very limited growth potential. Modern farming methods had made local farmers dependent upon expensive chemical fertilizers to regenerate soil nutrients for each year?s crops. The high investment required for modern farming had pushed many people to abandon their ancestral farming tradition and to take jobs in the nearest urban center, Chiang Mai city, two hours away. The local area also suffered from bush fires and drought during the dry summer months. The monks at Wat Doi Pha Som identified the principle cause of the many environmental and economic challenges facing the local residents to be the lack of adequate water resources in the local ecosystem. Water is a necessary ingredient for all plant growth and healthy ecosystem function. By addressing this basic need of all organisms, the process of holistic restoration began. The key in addressing the issue of water scarcity was creating environmental structures that retained natural water resources (mountain springs, rain water). The Rainy Season is capable of providing sufficient water resources to support the needs of both a thriving forest ecosystem and local agricultural practice. Deforestation of the land in favor of expansive farmlands removed necessary natural structures for water retention and increased water lost to run-off, which left the area?s soils thirsting during the non-rainy season months. The monk?s initial development projects constructed a long network of check dams able to retain natural water resources in a series of small reservoirs. The construction of the check dam system involved local community members, military personnel, and government officials. The collaboration between both local and external organizations (Government, Military, NGOs) is a key pillar in Wat Doi Pha Som?s sustainable development scheme. Twelve months after the check dams? construction, the moisture content and growth potential of the local soil steadily increased. Currently there are over 100 check dams of different sizes (0.25m-2m) in the Hoi Bong watershed. Reforestation efforts during the first year of development complemented the check dam network by supporting the soils ability to retain natural water resources. Plants from the ?sufficiency economy? three categories of resourceful plants (Food, Usage, Economic) were planted. These included banana, papaya, rice, guava, coconut, teak, bamboo, and red wood. The local ecosystem saw improvement in biodiversity and water retention and habitat restoration for numerous birds and wildlife. In the four years following the first year of the revitalization process, development projects continued to improve the system for natural water retention. The creation of a water line system involved upgrading wooden check dams to concrete and the creation of separate water storage reservoirs, known in Thai as ?monkey cheeks.? These storage reservoirs collect and diffuse moisture to the surrounding soil and can be tapped to meet community needs during the dry season. During this time as well, the reforestation process continued. More resourceful plants were planted and as soil moisture increase in the number of annual harvests coincided. Currently at Wat Doi Pha Som, the revitalization process focuses on maintaining the completed check dams network through monthly surveys and repairs. The current reforestation focus is on protecting local forests from wildfires as well as environmental terrorists that seek to extract forest resources illegally and unsustainably. The development of the alternative energy is an essential component of Wat Doi Pha Som?s sustainable development scheme. Initial experimentation in the community has been success in creating biofuel from locally grown sunflower oil and recycled cooking oil. Future development hopes to harvest clean energy through the construction of solar cells and small scale-hydroelectric dams. In 2007 the Alternative Education School at Wat Doi Pha Som was established. Eight students were enrolled in the first class. The revolutionary school seeks to serve students, families, local communities and Thailand by teaching sustainable development practices and self-sufficiency to the next generation of Thai citizens. Students are empowered to be self-sufficient citizens through project-based learning that encourages entrepreneurial development and requires integration of traditional subject material into practical application. Students have created their own educational pathways focusing on rich trade, herbal medicine, environmental conservation, and vegetable seed saving. The school values and strives to celebrate local customs and culture. Local community members teach students about cultural wisdom and traditional practices. Students have learned about local agricultural wisdom, how to make clothing, and how to construct a house using local building materials. The school also focuses on serving students? families. Students do not attend classes far from home, in order to be able to serve their parents and elders by performing chores and cooking at home.